Deer Capital of the World! For no one knows how many hundreds of years, a brisk trickle of fresh mountain water has bubbled from the earth within what now are the city limits of Antlers. Long before Civil War days, adventurers and Indians and stock traders used to halt in their day's prairie wanderings near this spring. It had a natural shelter of giant trees. When the Frisco Railway came through in 1887, its direct route south came within 20 feet of this famous pioneering stopover station and campground. Hunters used the spring and grounds as headquarters. The town was named Beaver's Station then. On the trees, they nailed huge antlers, trophies of the deer they bagged. 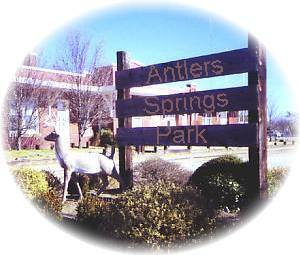 Automatically the spot became known as Antlers Spring. A train depot was built, a name needed for the budding settlement, and Antlers Spring became Antlers - the forerunner of today's Pushmataha County seat. The spring still flows today, as it did in early years - only a few steps from the center of enterprising, growing Antlers. Travelers who choose to make Antlers their "home base" will find themselves in a perfect position to make sojourns to the area's many lakes, rivers, and public lands - all easily accessible from the Kiamichi community. The highly-rated lakes of Sardis, McGee Creek, Pine Creek, Clayton and Hugo boast exceptional fishing and water recreation, along with clean, well-kept campsites. Not to be overlooked: The Historical Society Museum, antique shops, golf course, and specialty dining. The Frisco Depot at Antlers is now under the management of the Pushmataha County Historical Society. The building had been unoccupied since 1958 and was in a sad state of disrepair until 1985 when the depot had been slowly and painstakingly restored to the state of dignity that it deserves.